Just a reminder that there’s a lot of great local theater happening in this town. cash in on her dead mother’s stamp collection. As each new character enters the stage the plot takes another turn. 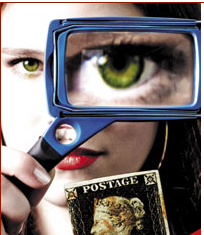 The stamp dealer is hiding something, the young woman displays her street smarts. Is her handsome young adviser working for her or against her. The sister reveals astounding self-interest. Word of mouth had this play extended twice. Rod Gnapp really stood out as Sterling, a man who covets stamps with a level giving all new meaning to the word perversion. He’s the bad guy you can’t help laughing at. Five talented actors show us five versions of greed. A classic who done it. When the 2010 season is announced remember to get your tickets. love the insight – will share!